Buying a home is always a big moment in someone's life. Although there are a few hoops to jump through, there are plenty of short and long term advantages of home-ownership. From having no restrictions on pets to building your credit each month, there's a variety of incentives to purchase your dream home ! The financial advantages of owning a home are excellent for the near future and beyond. Firstly, it is very likely, depending on your price range, that your mortgage will cost less per month than your rent. The total cost of purchasing a home go into the six figure range, but is paid in 12 monthly increments per year, for 30 years. Also, while down payments can sound scary, the availability first time home buying loans (FHA) makes them very affordable. Taxes are also more kind to homeowners than renters. Tax deductions from your mortgage interest and home depreciation can provide much needed relief during tax season. Lastly, with on time payments to your mortgage, come increases in credit score. While timely mortgage payments are always documented, rent payments are rarely recorded unless they are delinquent. Buying a home is more than paying money to live somewhere. It brings a sense of ownership and belonging. And with ownership, you decide if children can live in your home, or if pets are allowed. Your normal noise levels will more than likely not affect your neighbors, nor will you hear them while they move their heavy furniture. Decorating on a whim is no problem at all. You want every room a different color, no problem! Want new cabinets? Go for it! Want a garden? You got it! The most impactful difference between renting and owning is the wealth building aspect. Simply put, ownership puts you in a more advantageous position for generations to come. While only paying a 3.5% down payment, you would then own a property worth much larger than the amount you paid initially. In addition, you are building equity in your home by paying your mortgage monthly. What that means is the money you are paying would be able to be borrowed again at a later time. Equity is not being built in a home/apartment you are renting. The amount of equity being built in your home also increases yearly as the value of your home appreciates. Homes tend to increase in value at a 3% to 5% rate annually, which is derived from the total value of the home, not just the money you gave for the down payment! You've been paying your mortgage for 10 years and your car breaks down? Borrowing the money you need from your equity is an option that wouldn't break you pockets. Overall, there are a plethora of reasons to own a home. 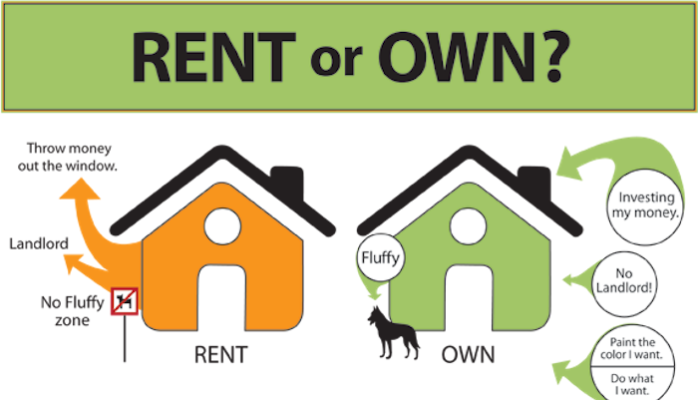 Obtaining ownership is a little more complicated than obtaining rentership, but renting does not offer the same long-term benefits that owning does. Nor does rentership allow the freedom that owning a home does. The financial benefits such as credit building and tax breaks, along with the sense of independence and dominion make buying a home the optimal option.